The 4th July Hwasong-14 ICBM launch. 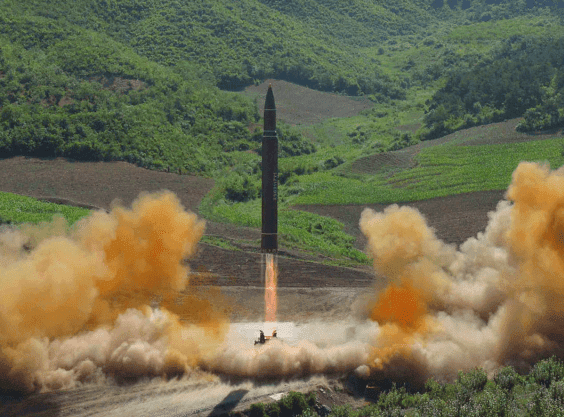 The North Korean TV channel KCNA announced that the missile tested was a new and more powerful one, the Hwasong-15, of which there are no available pictures, yet. On the 29th November North Korea performed her 20th ballistic missile test of 2017, the third ICBM (Intercontinental Ballistic Missile). As usual, the North Koreans chose to use a lofted trajectory (the missile reached 4500km high) and went just 1000km far. However, converting the test to a standard ballistic trajectory, the missile’s range, assuming the warhead’s weight corresponds to that of a real one, is 13.000km, i.e., capable of reaching New York or Washington D.C. The North Korean propaganda movies depicting images of American cities in flames and destroyed do not look as ridiculous and hilarious as they used to. Any Christmas gift from Pyongyang to New York would definitely be without love.